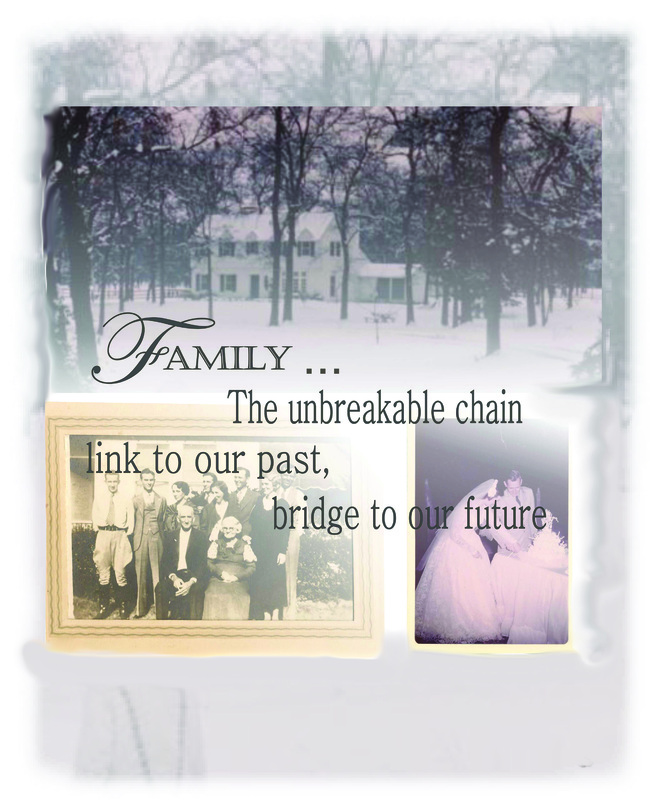 Family, it's the unbreakable chain, a link to the past,and bridge to the future. Each Family is unique, has a story to tell, and countless memories to share. We've come a long way from days when we had nothing more than the colorful tales told at family dinners and evening gatherings, or the generations of family births and deaths recorded in a single, treasured Family Bible to preserve our otherwise forgotten family histories. Although the times and the ways with which we share our past with subsequent generations may have changed, the importance with which we regard those who came before us and all of their achievements hasn't. We'd love to help you to create a permanent family keepsake to convey the important things to future generations while reflecting a character which belongs only to your own family. 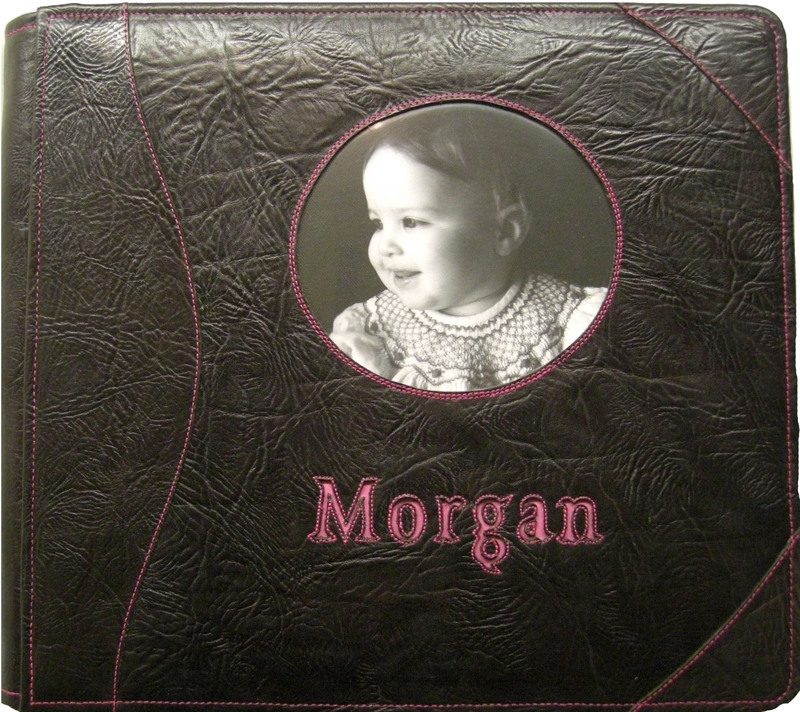 All Powell Leather Photo Albums are handcrafted from the highest quality materials available. Each leather panel is carefully hand selected and cut to dimension before being bound over a strengthened, moisture resistant core. Every care is taken to assure that each album will be a worthy keepsake, designed to preserve your precious memories for generations to come. Give us a call today with your special requests, we are happy to help you preserve your family memories to share as you build your bridge to the future. When the time comes for a member of your company or organization to retire it can be difficult to find a retirement gift that is appropriate to represent what has been most important to his or her colleagues with whom tenure was shared. Many groups come to us to design and craft beautiful leather books to present as retirement gifts. Often letters from colleagues, news clippings of important events, and other momentos associated with his tenure will be fixed upon the pages of the album. Our portfolio album lends itself perfectly to the purpose. It is filled with with 8.5" x 11" top loading pages which are easily loaded with whatever you like. The pages are made from an ultra clear polypropylene film, closed on three sides, with a heavy black cardstock sheet inside upon which the material to be presented may be easily mounted. The pages are bound into the book using posts which allow you to add and remove pages as you wish, The posts are handsomely concealed within the glazed calf binding bars which are stitched at the top and bottom to prevent them from flipping open and exposing the binding while still allowing easy access to the posts. All Powell Leather products are crafted from the best materials available. We take great pride in crafting products that will be as well made as they are beautiful. We hope that your Powell Leather retirement portfolio album will satisfy all of your expectations, and be enjoyed for years to come. Please feel free to give us a call anytime to discuss an idea, ask a question, or to place an order. We're looking forward to hearing from you! 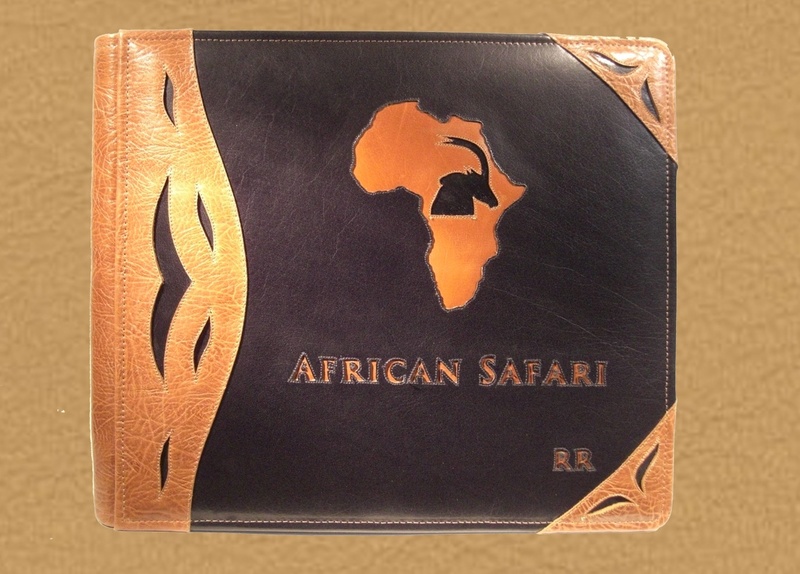 African Safari Photo Albums personalized to reflect your experience! So you've just returned from an African Safari with what are unquestionably the most spectacular and memorable images that you've ever captured. These, undoubtedly, will be memories that will last a lifetime, and now you're in search of the perfect African Safari Photo Album to handsomely accommodate your new treasures. You want these memories to remain to be as vibrant and spectacular years from now as they are to you at this very moment, and it's brought you to the realization that you'll need to find the perfect album to handsomely protect them until it's time to share them with someone once again. It will have to be sturdy enough to protect them through the years to come, while at the same time be a handsome album worthy of such a purpose. Where will you ever find such a book? Well, that's the easy part, and that's exactly what we do best! Just contact us at Powell Leather, and we'll be pleased to discuss with you where you've been, what you're hoping to achieve with your book, and how it might be accomplished. We'll be happy to work with you to create a photo album, or photographic safari journal, to reflect the character that you feel will most appropriately represent your safari experience. All of our products are crafted from the highest quality materials available in order to offer our customers lifelong keepsakes that are not only built to a standard above anything else available, but customized in such a way to reflect the character of the images contained within them. We're looking forward to hearing from you, and we hope that you'll choose Powell Leather when the time comes to assemble a custom orpersonalized safari album for whatever your purpose may be. 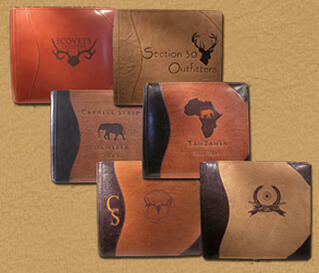 Leather photo albums for hunting enthusiasts! It's hard to beat the adventures that unfold when you muster the right group of friends for a hunting trip far from the bounderies of the "civilized" population. 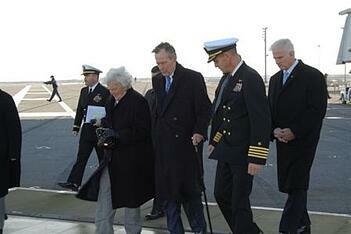 We know how important it can be to preserve those memories which mean the most. At our shop we regularly receive calls from customers who seek just the right photo album for their hunting images so that they may re-live their adventures with those with whom they will share them with in the years to come. We always like to spend a little time discussing with our customers what it is that they have in mind for their book, and we usually walk away having been told more than a few hunting stories along with it. We enjoy what we do here at Powell Leather, and that it something that helps us to do the things that we do better than anyone else that you'll find. It's our intention to build a book that you can be proud of, and will dependably serve you from here on out. We're looking forward to hearing from you, and also hearing what tales you've got to tell. We're eager to hear from you, and hope that you'll give us a ring whenever you've got a custom project on your mind. 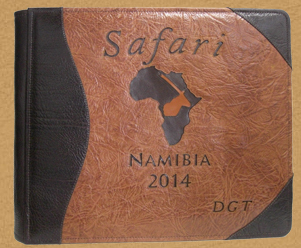 Order a Safari photo album that has been built exclusively for you! When you've just come home with the some of the most spectacular images that you've ever captured, naturally you'll want their presentation to be equally impressive. Powell Leather albums are handsomely crafted from the finest materials available to offer you years and years of enjoyment. We'll be pleased to help you develop your album's cover design. Please feel free to give us a call to discuss what it is that you have in mind, and we'll be glad to help you work out a design that will satisfy your needs. Most customers will let us know where they've been, what the highlight of their trip might have been ( an animal encouter or favorite location), the dates of the Safari, and any other pertinent information that might be helpful in working out a design for their Safari photo album. We'll take it from there. We employ several methods to create the art for our books. The method used depends entirely upon what sort of cover design will be chosen. Please feel free to give us a call anytime to discuss whatever you might have in mind for your Safari Photo Album. We're looking forward to hearing of some of your safari adventures, and helping you work out a design that'll soon be a part of your story. Anyone who has ever restored an automobile knows well that it is a labor of love. It is a reflection of the character of the restorer as much as it is a restored classic car when the dust settles, and the smoke clears. 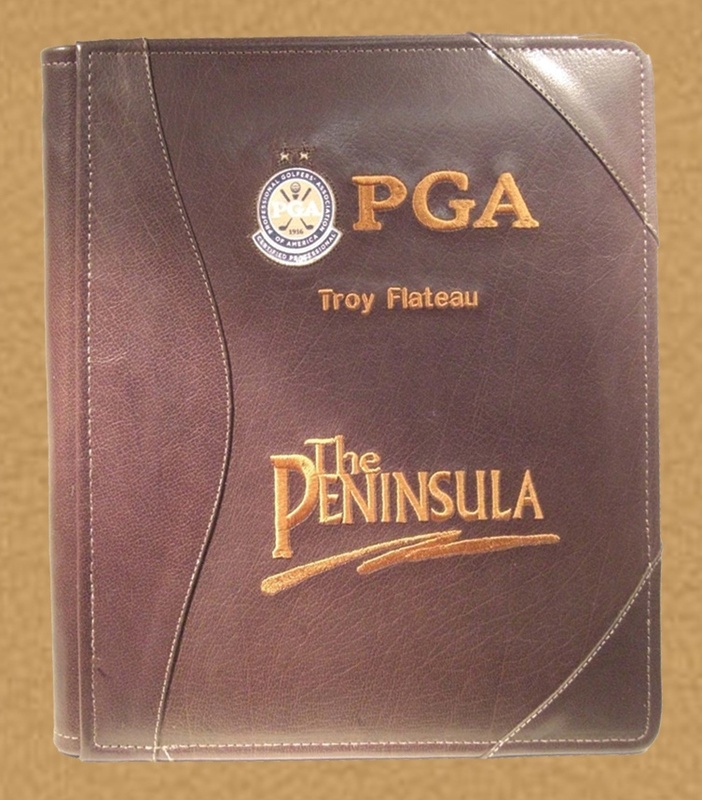 We hand-craft custom leather albums and presentation portfolios in much the same fashion. Each order that leaves our doors is a unique creation. 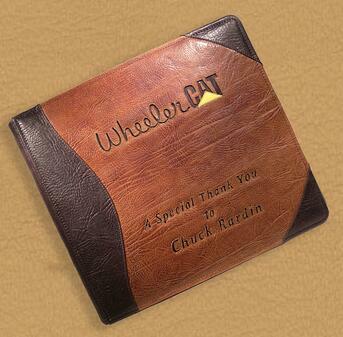 We will discuss with you what it is that you have in mind, and how you intend to use your custom leather portfolio. We craft our products from the finest materials available, and assemble them to provide years of service, beautifully. 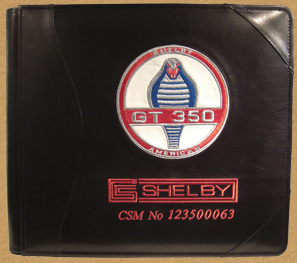 Whatever art that you provide us may be placed upom the cover leather, and if you're not sure how to begin we'll be pleased to help you design a custom car photo album for your purpose. Many other options are available depending upon the intended use of the book. You mayu want a document flap installed to hand out printed brochures at shows, or a pen loop, but whjatever your need may be, we'll be happy to toss around ideas with you. Please feel free to give us a call anytime to discuss what it is that you have in mind, we'll be happy to hear from you! 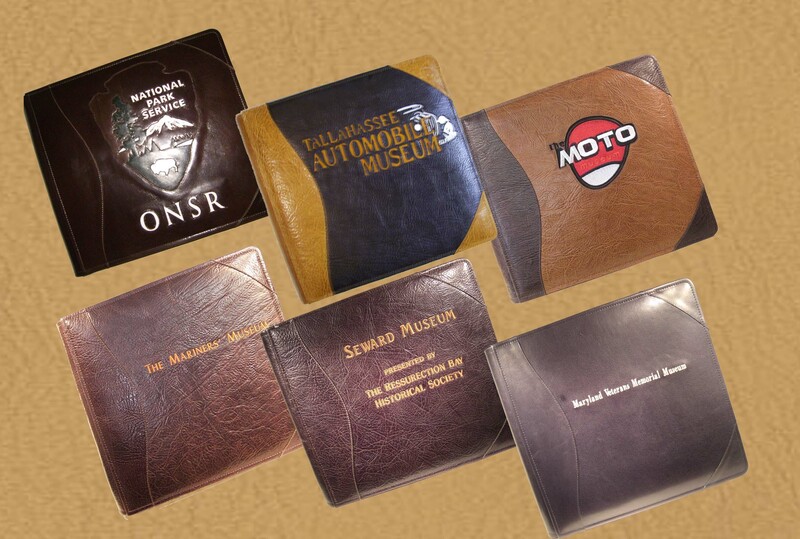 Powell Leather has crafted custom leather guest books for museums all over the world. 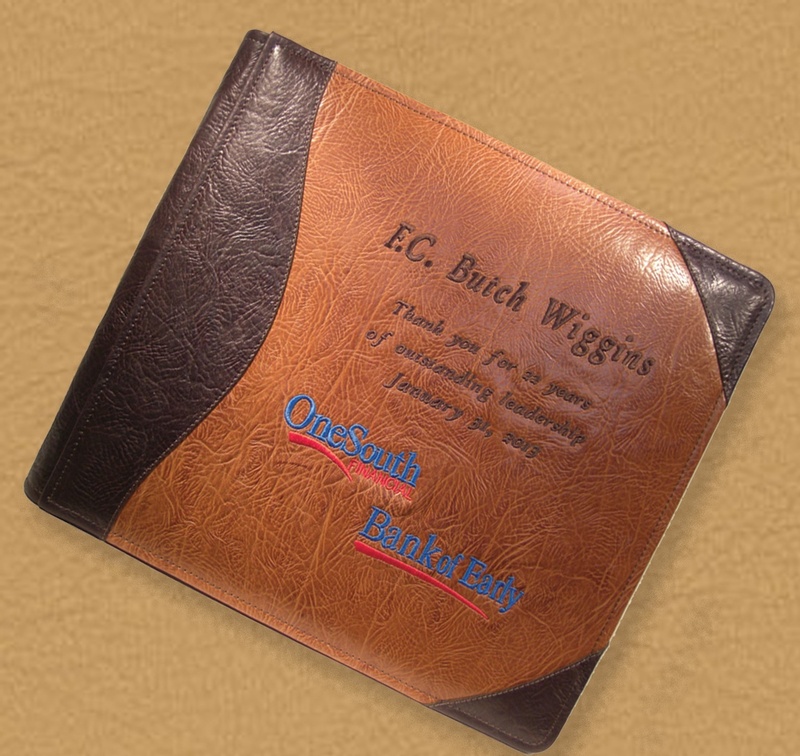 We'll be pleased to help you to create a personalized museum guest book with your own artwork, logo, or design fixed upon the book's cover leather. Depending upon what information is important for you to retrieve from your visitors, we will personalize your pages to create the ideal layout for your particular circumstances. Our custom guest book pages may also be adorned with whatever image that you provide us lightly watermarked behind the lines of the pages of your own unique design layout. Personalized guest book page refills are available from us anytime, and are just a phone call away. All of our products are crafted from the highest quality materials available, and are designed to offer a lifetime of faithful service. Please feel free to give us a call anytime. We're always happy to discuss what the best approach might be for a book to accommodate your needs.